Te’Quawn Stewart won’t wow you with his numbers in the box score. The senior for the New Castle High boys basketball team isn’t a high-volume scorer. He doesn’t often have the ball in his hands and he doesn’t take your breath away with highlight-reel plays. What the center for the 14-2 Red Hurricane does do is just about everything else. Stewart is a jack of all trades for coach Ralph Blundo’s squad, doing every job he’s asked to do on both ends of the floor. He can defend, rebound, run the floor and protect the rim. Stewart’s versatility, combined with his 12 points and 7.7 rebounds per game in three victories for New Castle last week, were enough to earn him Washington Centre Physical Therapy high school athlete of the week honors as voted upon by the New Castle News sports department. What makes the feat all the more impressive is that Stewart was able to shine despite playing all three contests with a broken nose suffered in the first quarter of the ‘Canes’ game at Beaver on Jan. 13. He underwent surgery for the break Monday. Stewart said that he tries not to worry about what the stat sheet says at the end of the game, he just wants to help his team succeed and do what his coaches ask of him. That Stewart was able to produce potentially the best week of his season following an injury that would leave some sidelined should come as no surprise. He has described himself as a “team first” player whose only concern is coming out ahead when the final buzzer sounds. Perhaps Stewart’s biggest contribution to the ‘Canes this season has been his defense. 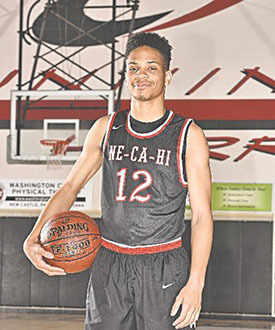 At 6-foot-2, he is the tallest starter on the team and the last line of defense for a New Castle squad that loves to press and cause havoc for opposing ballhandlers. As New Castle begins the back half of the season, Stewart says the team’s aim is to take it one game at time. But he added that a shot at the WPIAL and state title is definitely in the back of his mind.